What makes iPracticeApps so unique? Our philosophy when building iPracticeApps was not only to produce a beautiful looking app that has a whole lot of marketing functionality but, to go a step further and leverage off our technical knowledge around compliance systems like Nimbus, APS, Handisoft, MYOB etc to make an app that offered clients of accounting practices functionality so rich that they would use the App all the time. We also wanted to build apps that had a high level of customisation so practices get an app that reflects their culture and differentiates their practice. Since launching 4 months ago we have 43 practices on board who have trusted us to build their practice an app and have been humbled by the response. A good practical example of our approach is the release of www.iPracticeHub.com as a system to manage all the tasks generated by the apps we build for Accounting practices. We are finding that once clients of Accounting practices have the convenience of just whipping their phone out of their pocket or handbag the app becomes very interactive. So you can see that having a workflow task system to manage app generated tasks becomes critical. We have even included the option for push notification feedback to clients once their request has been completed. For example "Just a quick message to let you know Ron your database change request has been completed and all systems are now up to date". Its a great way to close the task app request loop. iPracticeApps provides a number of options around debtors and making it really easy for clients to pay their bills through your app. From a simple payment collection form to integration to your compliance system. By building an Alerts system into iPracticeApps you can keep your clients up to date with everything that is going on with the use of different media like video & podcasts. Then use the push notifications to advise your clients about the new alert. We can even build new alerts for you based around your client specialization. For example you might have a lot of clients in retail so we can create a Retail Alert option for you. To support the above Business Alerts, we have sourced an option with local Australian content on over 120 business related articles ready to post each week or we can automate the posting so you know they go out every week. We are finding a mix of phone usage with iPhones being the most popular but Android not far behind so making sure all features work on both systems is very important. Our approach to portal integration goes way beyond accessing the convenience and speed of giving your clients access to the portal documents through your app. We leverage off our 16 years experience building the ATO Paper Buster and knowledge of your compliance systems to help your practice build a combined App and Portal approach. We will share with you ways to get over 50% of your clients switching to digital deliver of documents and digital signatures. The convenience for your clients and the 10's of thousands of dollars you will save will have you asking the question "Why did we wait this long to get our clients using our portal?" If you don't have a portal we can certainly help you work out what to do. Join the special iPracticeApps private App community where practices can share ideas, we can keep practices up to date on new features and new ideas, support information, articles, good ideas, log a support call or call us directly, knowledge base, etc. All available in a login only app that you can access anywhere anytime. We don't have any lock in contracts and as part of the Premium package we sit down with your practice every 12 months and review your app and show you new features and ideas you might want to include in your app "Keep if fresh and full of functionality". With new features and ideas being developed all the time we don't want our clients to get stuck on the one app with no changes. You can login to the management console anytime and see live all you app stats . It even shows which parts of the app your clients are spending their time in. This is great feedback on how your app is being used. The iPracticeApps maagement console means you can change content anytime you want which gives you flexibility and speed in making changes. You have the option to go for a completely different look and feel for your app that makes your app unique to your practice. Your clients will love your new Practice App. They just search the app store and it's there. Why get an app for your firm? Send push notifications to your clients reminding them about critical tax deadlines. 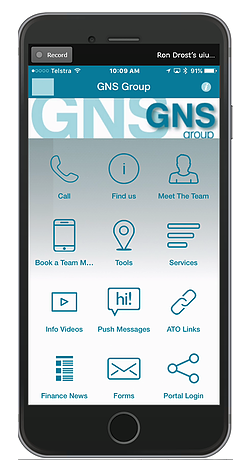 Allow your clients to communicate with you via their smart phone. Send reminders, chase up documents, you can even send push notifications to groups or just one person. Make sure your Practice doesn't get left behind. Having an App for your Practice will build deeper and stronger relationships with your clients. Help your clients access tax returns, financial statements on their smartphones using your Practice App. A sample of supported portals: MYOB, Nimbus, Secure Returns, Box, DropBox. Provide your clients with smart tools in one place in your Practice App. 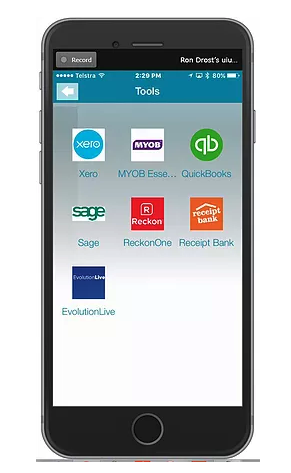 Quick launch Xero, MYOB, Quickbooks, Receipt Bank. 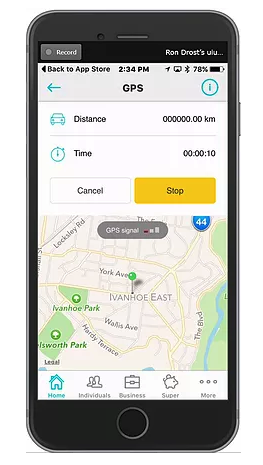 Launch the ATO's App with approved formats for taking photos of receipts and using Google Maps to automatically record logbook data. Provide your clients with quick videos on using their key applications like Xero, Quickbooks, MYOB. Present your newsletters as a video. Launch your own practice video channel as well. Use your Practice App to showcase your services and areas of speciality to prospective clients. This includes a testimonial icon and makes it really easy for your clients to refer their friends. We provide you with a web based App management system so you can send push notifications, update content and manage users. Your Practice App brings together a suite of useful tools your clients will love, which includes an optional integration with the ATO (now linked to MyGov). Your Practice App makes it really easy for clients to tell you about database changes and makes sure the Admin team gets notified. You can even direct a brand new client to your App and they simply fill in all the information you require to set them up properly on your systems. Now you can quickly and easily alert your clients about tax events that affect them. Tax Alerts support video, website links, text, podcasts, ATO links, etc. It could be something as simple as an article you read in the Paper. Use your App to keep your clients up to date. NINE UNIQUE TECHNOLOGIES WORKING TOGETHER TO MAKE SURE YOUR PRACTICE THRIVES AND GUARANTEES YOUR DIGITAL SURVIVAL. Make it easy for your clients to sign documents using your existing portal and digital signatures. We can build your firm a simple easy to use app your client's will love. Use the official ATO app to capture logbook information in the format approved by the ATO. Provide easy access to all the great tools you want your clients to use.